In recent years, there has been a growing concern over the soybean aphid (Aphis glycines), an insect pest of soybean and other legumes. This pest is native to Asia and was first detected in Illinois, United States in 2000. By 2003, the soybean aphid spread through most Midwestern States, predominantly showing up in soybean producing areas. The soybean aphid is of concern due to its ability to affect plant health through transmitting viral infections, causing losses in agricultural revenue. 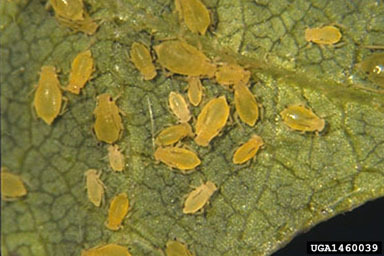 In 2011, The Wyoming CAPS program funded a survey for soybean aphid in Park and Goshen counties. The University of Wyoming Plant Pathology team performed surveillance inspections for soybean aphid in our leguminous regions. In addition, the pathology team inspected all soybean sentinel plots throughout the state which are hosted by the University of Wyoming: College of Agriculture and Natural Resources Agricultural Experiment Stations: Research and Extension Centers. Eighteen dry bean and soybean fields were inspected throughout Park and Goshen counties. All samples were negative for signs and symptoms of the soybean aphid.